With stunning views over the Mediterranean coastline at Kisla Bay Kalkan, the more tranquil area of Kalkan. With stunning views over the Mediterranean coastline at Kisla Bay Kalkan, the more tranquil area of Kalkan, Villa Kalkan Bir is the perfect choice for anyone wanting top quality accommodation in a great setting! With a mini market and a restaurant at the end of the road, a beach platform just a short walk down the hill and a water taxi stop to sail across to the main town, this villa enjoys a fabulous location with the beach and amenities of this charming resort all within easy reach. 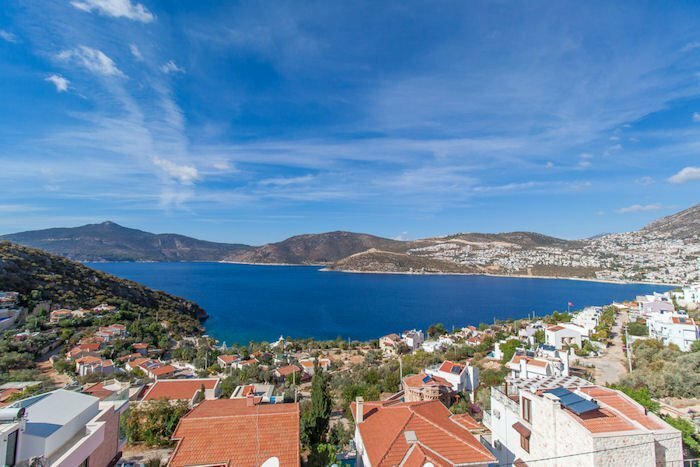 Kalkan is a beautiful resort with a huge choice of traditional shops, quaint cafes and spectacular restaurants to choose from, where you can enjoy a bit of retail therapy or dine alfresco with fantastic views over the sea. The villa itself is spacious, bright and contemporary in design, with 4 en suite bedrooms and includes Wi-Fi and air conditioning/heating in the lounge and bedrooms. The private infinity pool is surrounded by ample space to relax and soak up the sun while you admire the glorious views over the rooftops to the sea, with the Kalkan hillside rising up around the bay. There is a table and chairs on the covered terrace for alfresco dining in respite from the sun, complimented by the BBQ to one side of the terrace. The front door opens into the open plan living area which has ample seating surrounded by large windows allowing plenty of light and views over the bay. Ahead is a dining table and chairs adjacent to the fully equipped kitchen. Patio doors open onto the pool terrace. Stairs lead up to the bedrooms on the upper levels. On the first floor is a spacious double bedroom with en suite bathroom. The bedroom has 2 balconies, both facing the Mediterranean Sea, one set slightly further back than the other. On the second floor are 2 double bedrooms, each with an en suite shower room and private balconies with views over the swimming pool to the bay beyond. The twin bedroom is on the top floor and has an en suite shower room. The far wall of the bedroom is made of one large window with patio doors opening onto a spacious private balcony with fantastic views over the sea. From the private car port, steps take you past the swimming pool to the entrance at the side of the villa. Located on the hillside overlooking the bay, Villa Kalkan Bir boasts breath-taking views of the Mediterranean Sea ahead and the Kalkan resort centre to the East. Conveniently placed, only a stones' throw from the villa is a restaurant and mini market, and a short stroll down the hill will bring you to the water's edge with a long water slide into the sea and a select beach club. From here you can catch the frequent water taxi that sails the short distance over to the main harbour and town of Kalkan. This impressive 4 bedroom villa overlooks the Mediterranean coastline at Kisla Bay, a more tranquil area of Kalkan. The villa is ideal for anyone wanting to be close to the beach and facilities of this popular resort, with a restaurant and a mini market at the end of the street and a beach platform just a short walk down the hill where you can catch the water taxi to the main town. Kalkan has a small but pleasant beach only a few minutes' walk from Villa Kalkan Bir. Or, on the Western side of Kalkan, is Kalamar beach, which has a beach club and a couple of waterside restaurants to choose from.